Hello, I’m Jane Laverick. 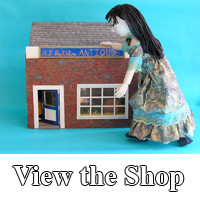 I’ve been making porcelain dolls and writing for magazines for fifteen years. I fell into the dolls’ house hobby through the rabbit hole called the Carlisle Collection of Miniature Rooms quarter of a century ago. This collection, like others, was seeded by Queen Mary’s Dolls’ house, that marvel of architecture in miniature intended to lift the spirits of the nation after a war and console a Queen who never wavered from her duty but would, perhaps, have preferred to run just a little stately home crammed with her collection of dolls and antiques. Having been raised as an antique-collecting-builder’s daughter with a myopic’s natural leaning to small, up-close items, after ten minutes in the Carlisle Collection I felt I had found my spiritual niche and left at the end of the afternoon determined to go and do likewise. Which is how I came to make a truly awful 3 inch balsa wood bookcase on the breadboard with a paring knife, as you do. I was lucky to live near a doll museum with a collection of dolls, some of them hundreds of years old. 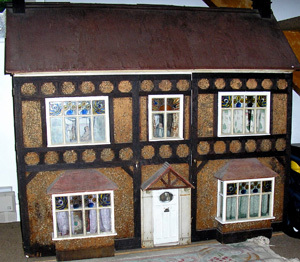 It also had a couple of dolls’ houses. One was Victorian, the other a miniaturisation of a real house that had stood by the castle walls, round the corner from the museum for four centuries. This house also owed its existence to Queen Mary and contained many of the miniatures that became commercially available at that time, such as a miniature wind up gramophone and HMV records. I haunted the museum and from the curator learned of Miniatura, the wonderful dolls’ house show in Birmingham at Edgbaston cricket ground. From the caretaker and the 1920s house I learned how to rewire a 1910 house I had just bought from an antique shop. I say that, sounding like a rich person who had just swanned into a shop waving money. Nothing could be further from the truth. My son, aged seven at the time, spotted the house in a shop window. I rushed back the next day only to discover that the house was for sale for £400. £400! It might as well have been £400,000 but I did a bit of haggling anyway, lowered the price to £360 with a promise to hold it as mine for a week and returned home elated and panic stricken. I had read myself far enough into the subject to know that new house kits were going for a similar amount and I had measured the house and was convinced that it was true 12th scale, the industry standard, which would make refurbishment do-able. I had examined the structure and could see that it had had woodworm but had been treated and stabilised, downstairs the walls appeared to have been built on top of the carpets and some child had daubed the occasional splash of red enamel paint on the otherwise white walls. Outside the pebble dash was falling off, the windows were cracked and some missing, part of the chimney was gone and the roof was seriously wavy but otherwise it was a genuine arts and crafts house built in that period with lovely fireplaces, four good big rooms, two halls and a loft. The whole house sang to my soul. The thing about parenting with a husband commuting over a hundred miles daily taking the car with him and your real house up for sale is that employment for oneself is out of the question. Who would employ someone with a ‘for sale’ sign in the front garden? In the end it was there for ten years during which we were permanently skint and the end of the month was always a thrilling contest to see which would run out first, the food or the money. Back at the start I, who had glued the soles back on my shoes so often they were mainly glue, just wanted £360, by next week. Happily I had an antique thing or two to hand acquired over my lifetime so far. Also happily, I lived in a town beset by antique shops and I was very good at walking. It took me a week to empty my real house down to the floorboards and acquire the dolls’ house. It was a week that changed my life and set me on course to learn more history, meet more people and acquire more skills than I thought possible. It turned the next fifteen years of thumb-twiddling commuting into an apprenticeship, in which I found some of the best craftsmen working today, in every branch of art, in miniature. I met savvy collectors, as thrilled as I was that old skills had not been lost. I learned through writing for magazines that what is in your head is not so different from what is in my head and that shared laughter makes a day brighter. All because I visited a museum. They should come with wealth warnings, really they should.